Summary : If you enjoy the taste of lemon, you'll like this moderately strong tasting lemon tea from Bigelow. It's not overpowering, but not weak either. Review : Do you like Lemon? Do you add lemon to everything you eat or drink? Is lemon water your favorite beverage? 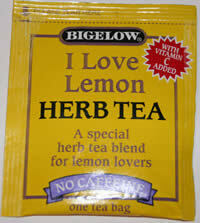 If so, I think you'll like this light tasting Lemon Herb Tea from Bigelow. And if lemon is most definitley not your favorite fruit around, I still think you may like this tea - as the lemon in this tea is of moderate strength and leaves a nice, pleasant after-taste. I must confess, lemon is not my favorite thing on this planet. Then again, I don't hate lemon either. I've even been known to sneak some lemon water from time to time. As such, before I tasted this tea I had absolutely no preconceived notions of what this tea would taste like. And so, armed with this open mind, I opened the foil which the tea was contained in. The first thing that greeted me was the aroma of Lemon. No mistaken it - this tea has a very strong lemon aroma. If you like the smell of lemon, stop right here, as there is no reason to read more. If lemon aroma is your "cup of tea", you'll most definitely like this tea. The lemon aroma even becomes stronger once you add water to the tea and it begins steeping. The tea smells of lemon - and no more. Then again, it is a Lemon Herb Tea, so I would have been surprised if it had a aroma of something different. Personally, I was rather surprised at how "lemony" it tasted. Most flavored type teas I've come across, particularly those which are bagged, frequently state they taste like so and so, only to have a taste that is often times quite different. However, after looking over the ingreditents of this lemon tea, I can understand why the tea has both a strong lemon aroma and flavor. The Lemon Herb Tea contains the following ingredients : rose hips, lemon grass, natural lemon flavor, lemon peel, lemon verbena, peppermint leaves, ascorbic acid (Vitamin C), hibiscus flowers and citric acid. All in all, quite the assortment of "lemony" things go into this tea - no doubt leading to the rather strong aroma and flavor of lemon. Yet, while the tea most definitely has a lemon taste, much to my surprise, the taste is not overpowering. Instead, the taste is distinctive - and is not overly strong. Drinking this tea is in no shape or form equivalent to, say, sucking on a raw lemon. Instead, the tea has a nice, moderate lemon taste that lingers on the taste buds. Even someone like myself, who is not a huge fan of lemon due to its rather strong , bitter, taste - will probably like this tea assuming you lat least partially like the taste of lemon to begin with. Overall, I was pleasantly surprised with this Lemon Herb Tea. I was expecting the worse and what I found was nice, aromatic and moderately flavored lemon tea that was quite appealing to the taste buds and was not bitter. That said, if you hate lemon in all shapes and forms, I would recommend staying away from this one - because lemon is all this tea is! Recommendation : If you like lemon, you'll love this tea. If you hate lemon, you'll despise this tea. Everyone else, worth trying - as the lemon taste isn't bitter or to terribly strong. Brewing Instructions : Pour 1 cup (for Bigelow teas, 1 cup = 8 ounces) of boiling water over tea. Let steep for 3-5 minutes. If you like your lemon real bitter, let it steep over 5 minutes.